When Carol Bonow founded Traveling with Carol, she dedicated herself to presenting the beauty of French culture and language to her travelers. Through her individually designed tours, she has successfully promoted the "love affair" between France and the U.S. underscoring the profound influence they have had upon one another. In addition to leading specialty tours for very small groups, she delights in creating itineraries for those traveling on their own. For the armchair traveler, Madame presents slide show soirées at various cultural centers in the U.S. Critics have claimed, "She has the eye of a painter and the spirit of an adventure photographer!" Love of travel and language are not restricted to experiences abroad. Carol has enjoyed many years of teaching in every conceivable classroom! Public school, private school, college and graduate schools! In fact, she founded the Bon Voyage Parlez Français French Language and Culture School in 1987 which is still active. Her latest and most fervent passion has been as educational consultant involved in bringing foreign language programs to elementary schools. With the All-In-One Program she targets age - 3-10 years old! This work has taken her to communities both in the U.S. and abroad. 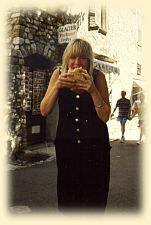 Traveling With Carol offers several unique travel experiences per year. With groups of from 3 to 8 guests, custom design is always possible allowing people to thoroughly enjoy their own tastes. Besides the high quality of the tour itself - stays in chateaux, Relais et Châteaux , S.C.H. , and Premier hotels - each of the tours is all-inclusive! Indeed, airfare is included! Added to the list of tours are Tuscany, The Cinque Terre, The Amalfi Coast, Venice, Romantic Spain, hidden valleys of Normandy and...New England!